The North Island IRB Championship winning team from Port Waikato managed to push their lead out to 25 points over their nearest rivals, and against 27 other clubs from around the country. Finishing the day in second was St Clair Surf Life Saving Club from Dunedin, who also finish as the top Southern Club on 35 points and who are vowing to defend their position tomorrow. Rounding out the podium in third is East End Surf Life Saving Club from Taranaki who finished on 30 points. However, they’re only five points behind the South Island crew and will be pushing hard tomorrow to move further up the leader board. The top five is completed by St Kilda Surf Life Saving Club, who are also the current South Island IRB Champions, and Mairangi Bay Surf Life Saving Club, who finished on 25 and 23 points respectively. Meanwhile, the local team from Waihi Beach sit on 12th equal with Waikanae Surf Life Saving Club and Fitzroy Surf Life Saving Club, with a total four points each. With three different race formats being held tomorrow, the mass rescue, single rescue and team rescue, dozens of points are up for grabs meaning the two-day melee will intensify tomorrow as clubs compete to become the 2018 national champions. BP New Zealand IRB Championships event manager, Johnny Clough, said it was an entertaining first day of racing due to a “decent swell” and tomorrow should be equally as exciting. 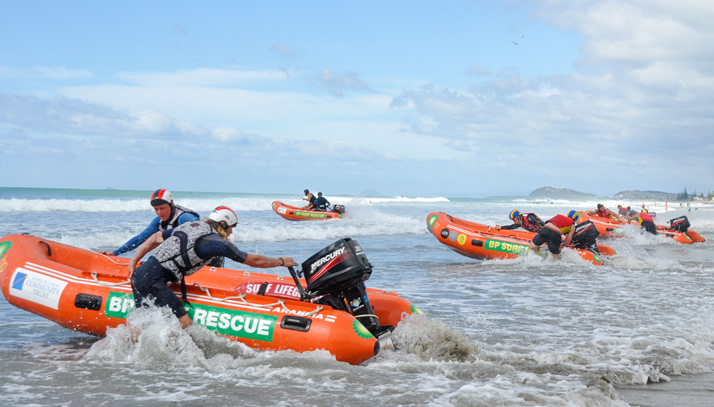 “The first day of the BP New Zealand IRB Championships has been fantastic. We have seen some great racing, even with the swell, which definitely made things more interesting. But it also shows how perfect Waihi Beach is for an event like this. Racing continues tomorrow from at 8.30am on the beach outside Waihi Beach Surf Lifesaving Club.